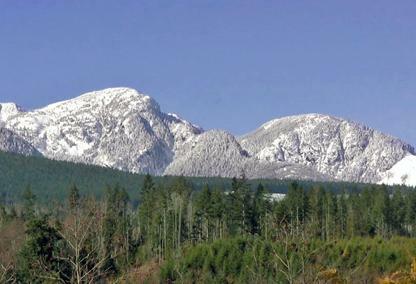 Beaver Creek is the Alberni Valley’s largest and most diverse rural neighbourhood. It is framed in to the west by the stunning Somass and Stamp River Rivers. These rivers offer those lucky enough to ply them, some of the best fresh water steelhead and salmon fishing in the world. Locals and tourist alike know the Stamp River for another reason – white water rafting. Well actually you’re more likely to see groups of people laughing their way down the river on inner tubes than on rafts, which is a testament to the areas industrial heritage. If you do decide to go for a tube ride, make sure you know the river first because there are dangers. Which brings us to, what is no doubt, Beaver Creek’as most popular attraction – Stamp Falls Provincial Park. Stamp Falls Provincial Park is home to a river side campground and what is arguably the most beautiful old growth hike in the Alberni Valley - the Stamp Long River Trail. But the focal point of the park is the mighty Stamp Falls themselves. If you visit in the early fall you will witness one of this earths greatest wonders as thousands of Pacific salmon jump the falls, or use the nearby fish ladder, to return home to spawn. Along the Somass River in the Beaver Creek area you will find Paper Mill Dam which provides a beautiful river front beach and a great park for picnics. Here the adventurous can even snorkel with the massive Chinook Salmon. To the east Beaver Creek is framed by the majestic Beaufort Mountain Range. Running along the foot of these mountains is the iconic 22 km long Log Train Trail. The Log Train Trail pass right by McLean Mill National Historic Site, a former 20th century sawmill and logging operation, located on 13 hectares of forested land. But at the heart of Beaver Creek is the people. Creekers, as they’re called locally, are honest, friendly and hardworking people. In Beaver Creek you will find everything from large farms to small hobby farms, modest family homes to some of the most beautiful estates in the Alberni Valley. A trip out Beaver Creek will have you just as likely to see riders on horseback along the side of the road as not. Beaver Creek is Vancouver Island living the way it should be. It represents an outdoor lifestyle and culture that is unique to our island. So come and visit sand spend a day, or more, exploring Beaver Creek. Beautiful Somass Riverfront Property. Situated in Beaver Creek on a no thru road, this gorgeous property offers just over 5 acres awaiting your ideas. In the ALR.